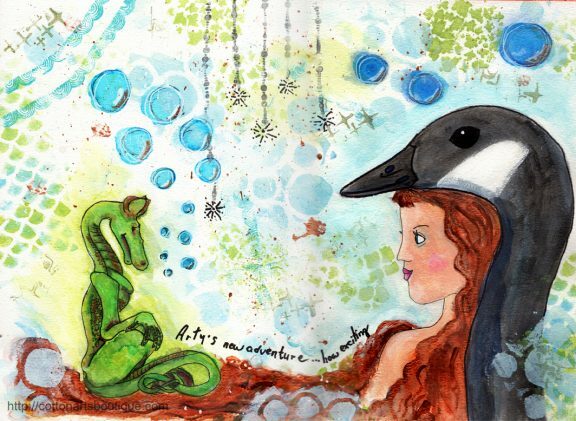 Arty’s new adventure….when Tamara painted a woman with a swan headdress with a fairy on her shoulder I knew I had to paint a Canada Goose instead and then Arty, my little adopted dragon whispered it was time for a new adventure so I painted him in as well. You can read about Arty here: Arty As you can see, my little dragon is still blowing bubbles. This course has been a great journey and I am now confident enough to go off on my own as I did with this piece. It will continue with Life Book 2016 … I was granted Life Book 2016, how cool is that? Thank you Tamara.